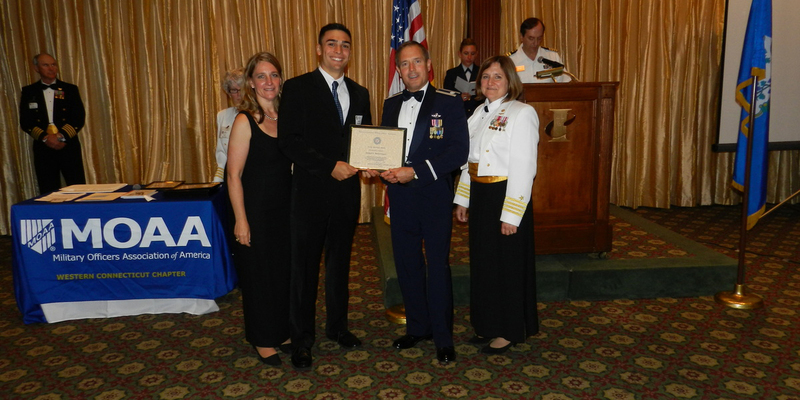 2013 Young American Award Recipient – LT Susan Monks, Lt Col John Simonetti, and CAPT Dori Freer presenting the Young American Award to a HS Student. 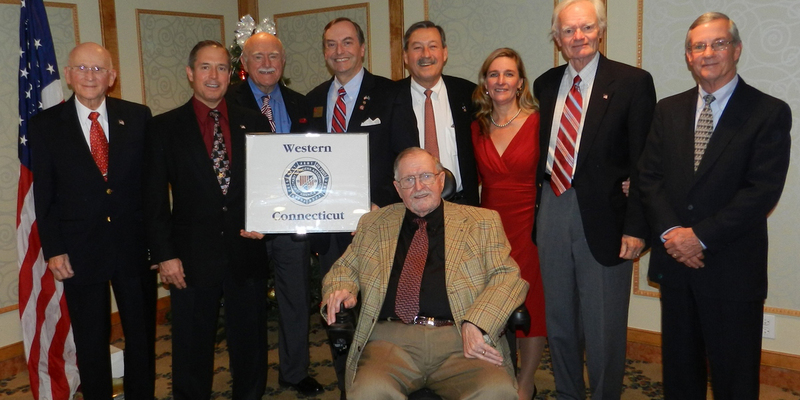 WCMOA Executive Board Members – Current Executive Board Members for the Western CT Military Officers Association. Front: LTC David Cole. 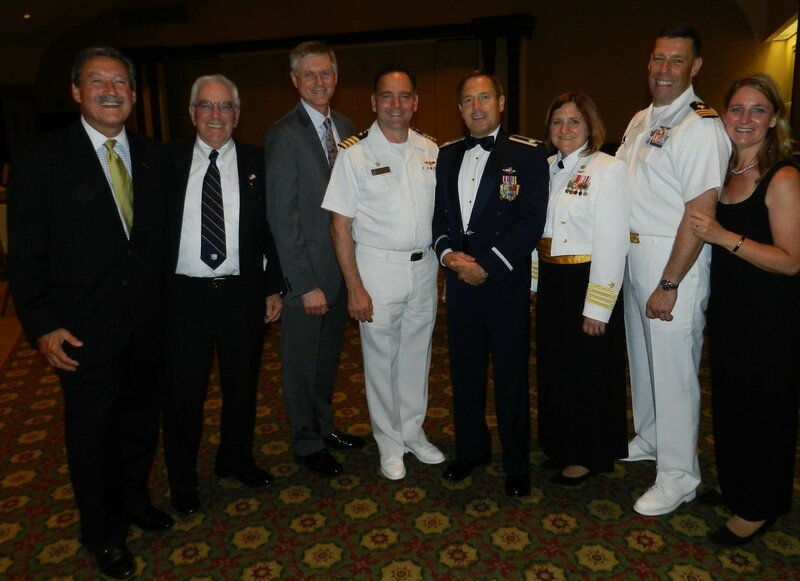 Standing: CDR Jim Botten, Lt Col John Simonetti, COL Serge Gabriel, CAPT Bill Glass, LT Don Boyle, LT Susan Monks, LT Roger Wanamaker, and LT Tom Gabrielson. Young American Awards Banquet – June 9th Don’t Miss it! 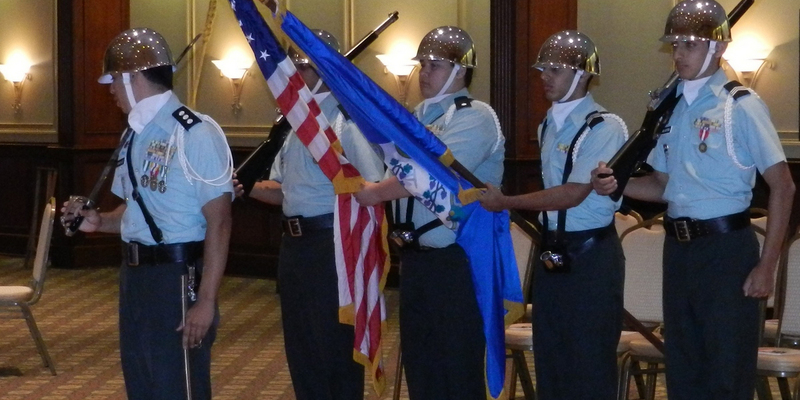 Join us at the Ethan Allen Hotel in Danbury to honor this year’s Young Americans – 30 patriotic High School graduates from Fairfield County Schools who show outstanding leadership potential. 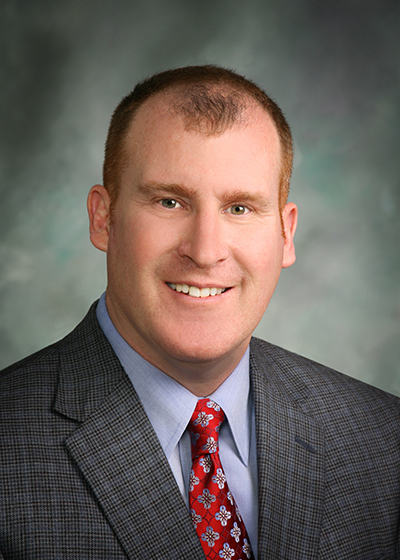 Tom Deierlein, the CEO, is a former U.S. Army Major and Operation Iraqi Freedom Vet. A Bronze Star and Purple Heart recipient, he is now medically retired with a 100% permanent disability rating. He has been involved in the sales, marketing and operations of mission critical applications and emerging technologies since 1993. Tom’s call sign while serving in Baghdad was “ThunderCat 6” – hence our name: ThunderCat Technology. Graduating from United States Military Academy, West Point in 1989, Tom spent nearly five years in the military; first, earning his Airborne Ranger qualification and then, onto various leadership positions with the Berlin Brigade. Tom gained extensive leadership and operations experience while leading three different organizations and coordinating activities for over 800 personnel from 4 countries. In late 2005, Tom was recalled to active duty serving as a Civil Affairs Officer in East Baghdad. There, he helped manage over $290 million in reconstruction and economic development projects. In September of 2006, he was shot by a sniper and critically wounded. The bullet shattered his pelvis and the base of his spine. After 8 months of intensive care at Walter Reed Army Medical Center and the VA Polytrauma Rehab Center in Tampa Florida, Tom returned to the business world in June 2007. Tom first got involved in the technology field in the mid 90′s with Parametric Technology Corporation, working with clients such as IBM and United Technologies. He ended up as worldwide Account Lead for electrical connector giant, AMP. In 1996, he joined internet start up, NetGravity. During this time, he played a key role in the development and sale of the first fully networked version of NetGravity’s original AdServer system. He also played a critical role creating the original storage and hosting relationship between CompuServe and EMC. In 2000, Tom joined up with Dynamic Logic, a technology-based research firm that tracks and reports on interactive advertising performance for clients like Oracle, Cisco, Intel, DELL, Microsoft, and Symantec. As their Chief Operating Officer, he was instrumental in the growth and development of that company from 7-person start up into clear industry leader. Tom has also earned a Master of Science in Systems Management from University of Southern California in 1993 and an MBA from NYU Stern School of Business in 2000. Tom has been quoted and featured in The New York Times, NBC Nightly News, Forbes, Wall Street Journal, MSNBC.com, and PARADE Magazine. In Fall of 2006, a foundation was started by Tom and others to assist Iraqi Children. TD Foundation provides aid to children directly affected by war in Iraq and Afghanistan, as well as to children of wounded warriors and fallen heroes here in the US. All participants are volunteers and 100% of funds go to those children and families in need. Additionally, Tom is a mentor with Care Coalition. He coaches and supports other severely wounded and disabled Special Operations Command (USSOCOM) soldiers and their families to assist in the transition to the civilian world and workforce. Our Spring Fling was at us at the Redding Country Club on March 24th. 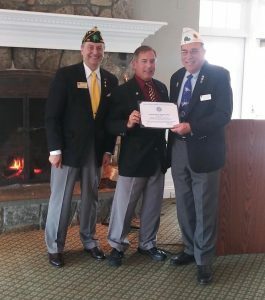 Our guest speaker was Connecticut American Legion Commander CMSgt Tom Flowers, USAF (Ret). Tom was born in Waterbury, Conn., in 1947 and raised in Stratford, Conn. He entered active duty military service in the United States Air Force in 1966. His career in the Air Force spanned 27 years until his retirement in 1993 in the grade of Chief Master Sergeant. After his retirement from active duty, Tom went to work for Specialized Marketing, Inc., in Dallas, Tex., as a multi-state Regional Sales Manager with his clients being exclusively military installations. Tom retired again in 2005 from Specialized Marketing and moved back to his home state of Connecticut. If volunteering on behalf of Veterans causes is considered another career, Tom has no plans to retire again. He has been associated with The Fisher House Foundation since 2010, he is currently the Commander, American Legion Department of Connecticut, and is the Chairman of the Veterans Commission in his current home town of Milford, Conn.
Dec 9th was Our 60th ANNIVERSARY Clebration! We celebrated the Christmas holiday and our 60th Anniversary as a MOAA affiliated Chapter on Dec 9th at Redding Country Club. MOAA’s Executive VP and COO, Col Jim O’Brien was our guest speaker. During O’Brien’s 25-year career, he served in a variety of financial management positions at all levels of the Air Force, including four command positions. His final assignment was comptroller for the Air Force Reserve, where he was responsible for nearly $5 billion annually. 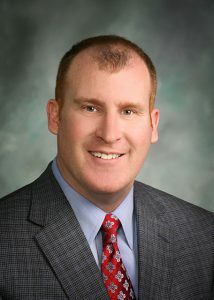 O’Brien is a graduate of Norwich University in Vermont and holds a master’s degree in systems management from the University of Southern California. Additionally, he is a graduate of the Air War College and a senior executive fellow from Harvard University’s John F. Kennedy School of Government. A GREAT TIME was had by all and we raised over $300 for the YAA! 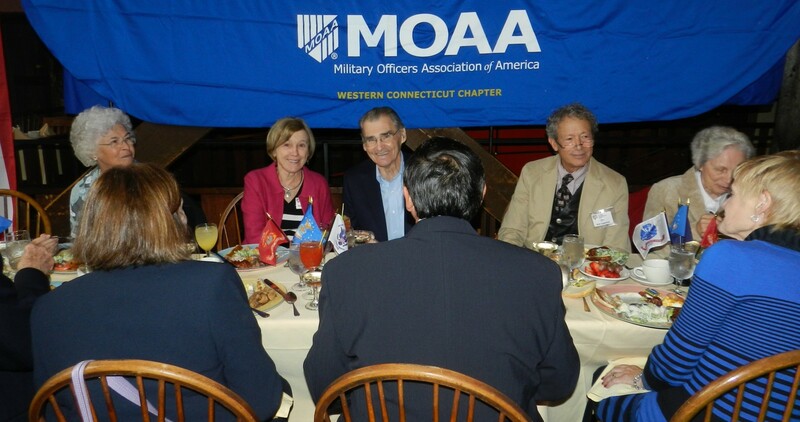 COL O’Brien shared some key MOAA updates and his upbeat personality was a perfect addition to our holiday event. Kudos to LT Don Boyle for negotiating this new venue! If you missed it, we’re going back there March 17th for our Spring Event. Stay tuned and members can expect our first quarter newsletter by the end of Feb.
We also elected our new Executive Board of Officers for 2019. Check ’em out HERE! at Port 5 in Bridgeport. 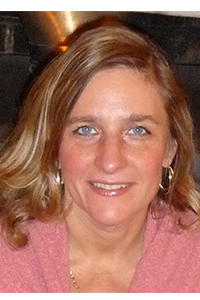 Sherri is the Veterans District Aide & Service Academy Coordinator for House Representative Elizabeth Esty. 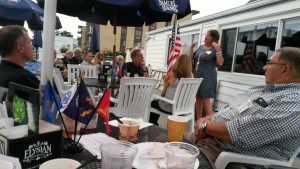 Sherri is a Gulf War veteran and does a fabulous job for the congresswoman. She will share with us what has been happening in Wash, DC as it relates to veteran matters and the VA: Recent legislation that has passed into law; Legislation and veteran issues that is expected to be addressed by Congress; And, other veteran issues that need to be addressed. Sherri brings a lot of enthusiasm, energy and knowledge. Click it! –> YAA 2018 Recap! Our summer membership gathering on September 20th was a huge success. First time on a Wednesday. First time in the evening. First time at Port 5. First time hosting a BBQ. The 2017 Young American Awards Banquet was held on May 23rd. It was a huge success! We had 136 attendees and gave $5700 away in scholarship moneys to 22 most impressive High School seniors. Here is the list of this year’s YAA Awardees. 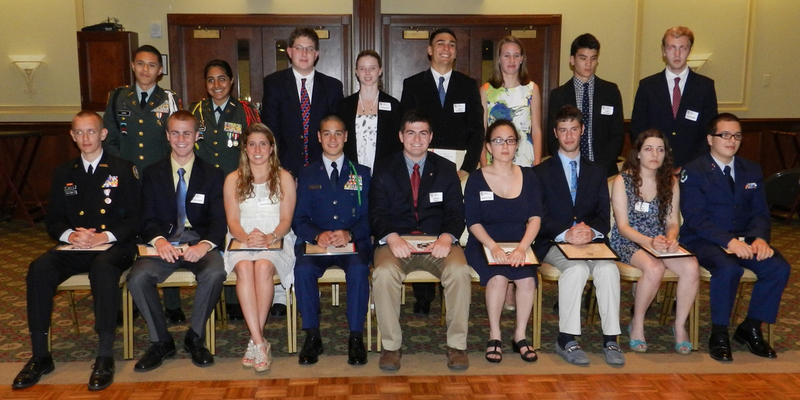 Many of them will be on their way to our military service academies. LTC David Cole was this year’s YAA Chair and everyone agrees it was the Best Ever! 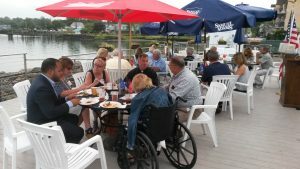 The new venue at Shore & Country Club was awesome! Bravo Zulu, David! Well Done! 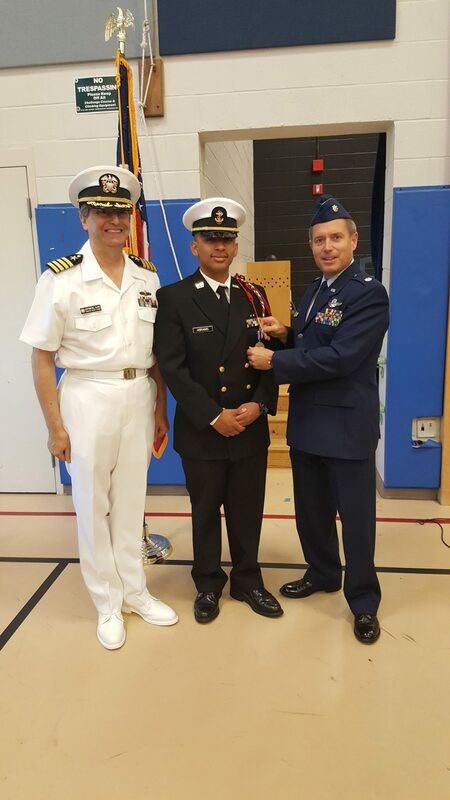 WCMOA President Lt Col John Simonetti, USAF (Ret) and past president CAPT Bill Glass USN (Ret) present the MOAA JROTC Medal award to Cadet Lt. Commander Jessie Abrams of Bridgeport Military Academy during an impressive ceremony held at the school on 2 June 2016. 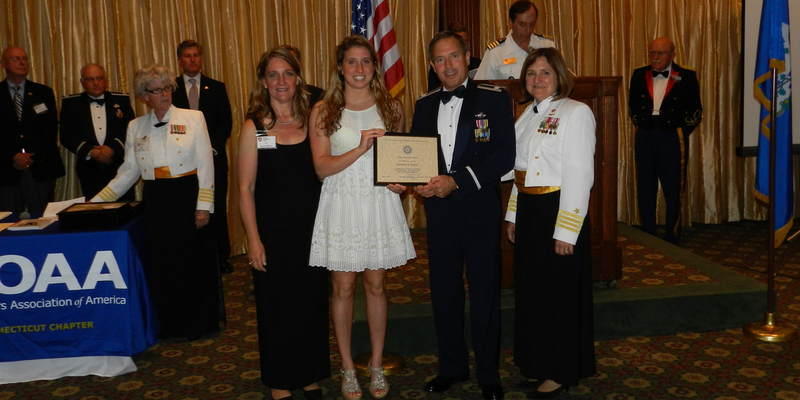 CAPT Glass has been the Senior Naval Science instructor at the Academy since its inception in 2013. Men and women who have served or are serving on active duty, or in one of the National Guard or Reserve components, as a commissioned or warrant officer in one of the seven US uniformed services, as well as widows or widowers of any deceased member of one of those services (auxiliary members). Yearly Dues are $20.00, and our year starts each January first. Auxiliary members are dues exempt.